Webmasterquest.com is truely an amazing free traffic generator. Don't believe us read our member testimonials to hear what they have to say about the site! I belong to a few Traffic Exchange programs, but when I think of the best one to use to generate signups on my website, I think of WebmasterQuest. I know I will receive traffic from real people. Only been using Webmasterquest.com for a short time, and it's my favorite program to use to get REAL people viewing my online store! The best part is, people are buying from my store, or signing up as my referrals! When I check where my customers saw my store, they say "Webmasterquest"! 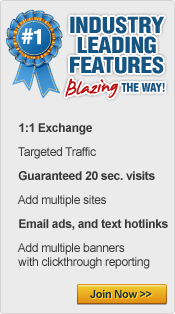 its the best free traffic site on the internet!! I really enjoy using webmasterquest! In anticipation of the Residual Club launch, my Webmasterquest Premium Membership permitted me to load up on page views and banner impressions--it had a huge impact: I became a Top 20 recruiter out of 8000+ members. I advertise WebmasterQuest on all my websites as simply the best manual traffic exchange. Your anti-cheating system is streets ahead of all the others. In the past, when I had a few problems with your surfbar, I was impressed by your prompt and helpful responses -- even when you thought I might be cheating (which I wasn't!). I really appreciate your hard work and dedication. I really like the "e-mail" ads and the hot links. These help to target the visitors that equals a better chance of making a sale. Winning hits playing the scratch cards is fun and a change of pace from the other surf exchanges. I have not been using WebmasterQuest very long and I have already had almost 27,000 banner impressions! No one else offers the variety of ways to surf and earn credits. Banners, email and website views. I don't go there very often but still get a lot of traffic from them. Also, the auto-login icon is fantastic! WebmasterQuest is one of my top traffic generators. Thanks guys for the valuable resourse of WebmasterQuest. I have been using your hit exchange program from the beginning. It is my view the best (symply the best) The features of being able to add multiple sites or pages has really been an asset. I purchase banner ads and hits to my sites to get a robust leap. I know that using WebmasterQuest has put money in my pocket. You guys are always thinking, improving the site and coming up with new ways to get more traffic, the hotlinks that I get free with every hit is a great feature. Keep up the good work. WebmasterQuest today and for the future. I have to admit to all, that you people at Webmasterquest have given me an absolutely superb return on my surfing. In the past, I've spent hours surfing many other exchanges which gave me nothing more than a sore clicking finger, but Webmasterquest gave me the results that I was hoping for. My credits utilized efficiently and quickly in a manner that shows other programs, who the real professionals are! Not only that though, I have also gained ten more people who have also decided that this is a place to get visitors to their sites and agreed to sign up below me giving me a downline that now also puts credits into my account. What more could a person ask!! Thankyou Webmasterquest, you're sending far more business to my site than I ever would have expected. WebmasterQuest Has Produced The Best Results! Fact is I have paid for advertising on 3 other high profile Traffic Exchanges, and WebmasterQuest has produced better results than the 3 Combined! 9 Paid Memberships to My Site and 2 Of these members produced 11 more paid members! And A Staggering 2.79% Hot Link Clickthru. I think that Webmasterquest is a great site. Always keeping members updated as to what is going on with the site. I have liked the site from day one. E-mail responses have been excellent. I picked up $5.00 for being on the site. Webmasterquest to me is a top of the line site. Webmasterquest is the best one so far and I just Joined it last night. You need to join it also! I have been a WebmasterQuest member for over a year now and have enjoyed it immensely. It seems like everytime I turn around, they are adding new features to make the program more interesting. I especially like the no-cheat methods and the extra ways to earn credits. I try to log in as much as I can and when I do, the first items I go to are the wonderful Site of the Day and the Pick 6 Lotto. Once I finish with those, I visit the Scratch Card area and spend a few moments "playing around". Then when I am ready, I read emails first for awhile, then surf sites for credits. All around, I would highly recommend WebmasterQuest for anyone who owns their own website. I'm the owner/webmaster of several sites and they are all added to my WebmasterQuest account. If you join any one program, make sure it's WebmasterQuest! WebmasterQuest ist ideal um Programme aller Art zu promoten - probieren Sie es aus, der Erfolg stellt sich schnell ein! Verk�ufe! Referrals! Downline-Mitglieder! WebmasterQuest is ideal to promote all kinds of programs - test it, the success will come soon! Sales! Referrals! Downline-Members! I love this program! It has everything I need to promote my business and it's well within my budget - FREE. I've been using it for about 2 months and have 3 signups and have promoted other businesses as well. The banner impressions is my favorite feature because I get the most response and makes it worth every penny I paid to have my webmaster design it. The Hot Links feature is good too for promoting my friends' businesses. Excellent job WQ team!! I'm Paul Bogaard, President of the 2 Tactics moneymaking program. We included WMQ in our program as 1 of the 10 bests programs on the internet. We ask all our members to sign up with WMQ and use it as much as possible. There's not only the traffic exchange but we're getting a lot of sign ups for the 2 Tactics program from the HOTLINKS ans E-mail service as well. Our members really like WMQ and getting mystery prizes while surfing. I love webmasterquest because they help me to get the much needed traffic to my site. I have recieved many signups as a result of using webmasterquest and I absolutely love their anti cheat measures. Their 1:1 ratio can't be beat(at many traffic exchanges you have to pay to get a 1:1 ratio) and when I surf webmasterquest I almost always win extra credits. When it comes to getting traffic to your site, webmasterquest can't be beat. I have been successfully using the WMQ Traffic Exchange for more than 2 years to promote my products. I rely on WMQ for quality visits to http://www.Lougo.com and make regular sales through your services! My mailing list is filled with VERY responsive leads through your referral. Your credits are worth GOLD to me! Thank you for a professional business promotion tool! As a web hosting company, we have advertised on many web sites. However, WebmasterQuest is among our top choices. If you need tangible results from your advertising and not just hits, then we highly recommend advertising at WebmasterQuest. Whenever I join a program, I make note of the traffic exchange where I saw the ad and signed up from. Then, when my new sponsor emails me a welcome message, I email back with the name of the exchange. It seems like most of the time I'm telling them "I saw your site on WebmasterQuest". As a traffic exchange owner myself I know what to look for in a traffic exchange. As busy as I am I don't have time or money to waste on inefficient advertising. That's why I am a proud member of Webmasterquest. I know my sites are viewed by interested members as the results are always great. I also appreciate the quick and efficient way my e-mails are answered and the way the owners are always working to improve the quality of traffic so I know my credits are not wasted. My first stop when promoting a new site or program is WebmasterQuest. This is the *only* traffic exchange I use and the reason I choose Webmaster Quest is simple - there is QUALITY traffic to be had here! You are an invaluable tool in this webmasters arsenal - keep up the good work! Over the last 12 months, I have systematically tracked the "real world" response ratios across the top 50 startpage exchanges. Without a doubt, WebMasterQuest produces the best results. Their advanced anti-cheating technology insures that real people (potential customers) are watching, and absorbing the information contain within the startpages that are shown in rotation.